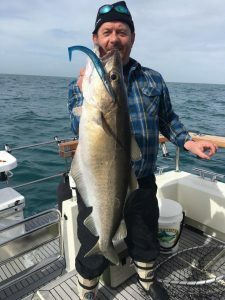 Late September and early October is usually the time for the first run of cod, but this year the water temperature has remained higher than usual by just a few degrees which may have delayed things. 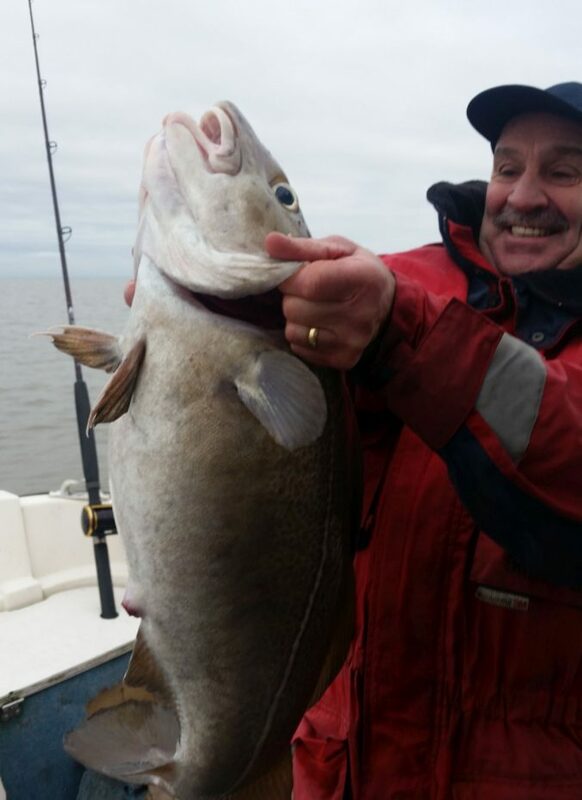 Although there have been some cod caught, it wasn’t until mid-October that they started to show more frequently. 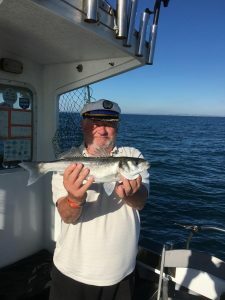 On the other hand, there have been plenty of large mackerel still around to give sport on light tackle or just top up the bait supplies. 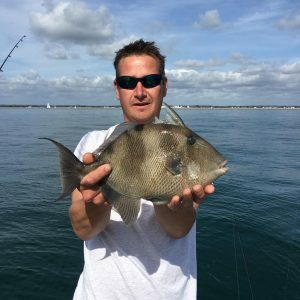 Trigger fish don’t stay around for very long but there are worth targeting while they are here. 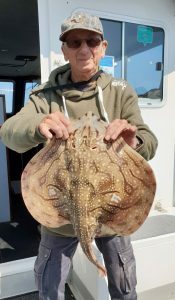 Bill Arnold shows a typical fish caught in late September – very exotic-looking for a UK fish. 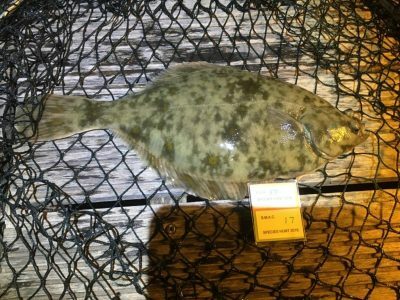 Another visitor is the Couches bream, which is far more common in warmer waters of the Mediterranean and Americas. 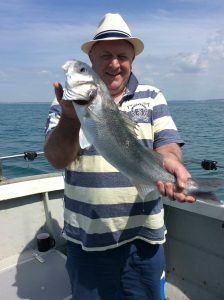 Mick Barry caught this nice 3lb 14oz fish from Valkyrie 6 on squid strip. 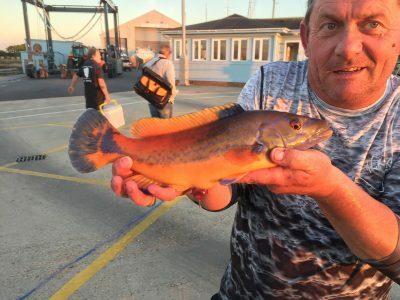 And to remind us that UK fish can also look exotic, Heber Crawford caught this male and female pair of cuckoo wrasse which wouldn’t look out of place in an aquarium. 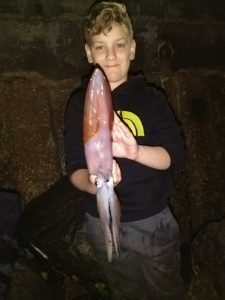 Squid fishing has been a minority sport along the South Coast for many years but recently there had been much wider interest, partly because there are plenty around, large ones at that, and partly because of the development of squid tactics and tackle pioneered by the Japanese and Australians. 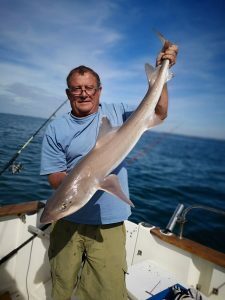 We used to rely on a luminus barrel lure costing about £1. 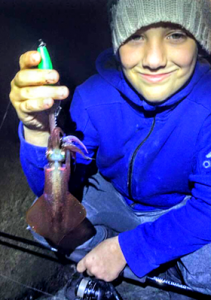 Now you can spend over £16 for a rattling, glowing, vibrating, textured lure which although very attractive to squid, it is just as attractive to snags. This can make trips rather expensive. 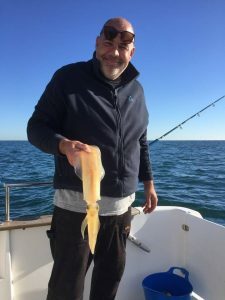 The start of the squid season has arrived in this area and they should stay around in numbers until late winter, although a stock will remain all year. 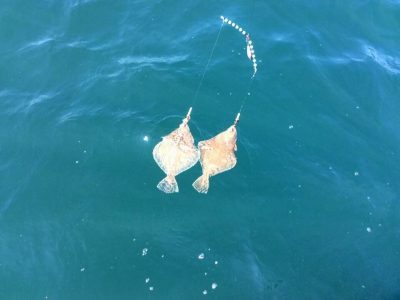 Most anglers target them from shore marks but we are also catching them from boats. 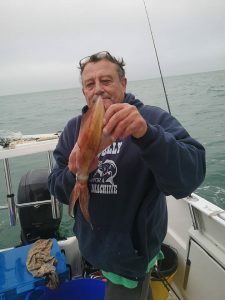 With the price of squid for bait plus the culinary value (much better than frozen!) 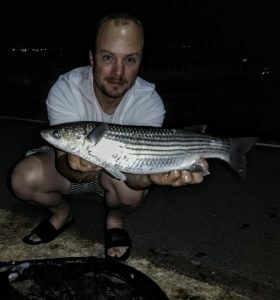 we expect a lot more to be caught. 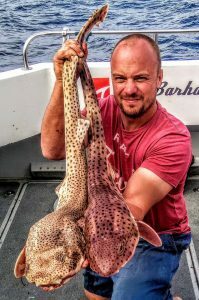 Heber and Archie Crawford show examples of squid caught recently. 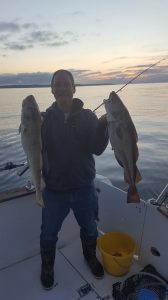 Now to cod. 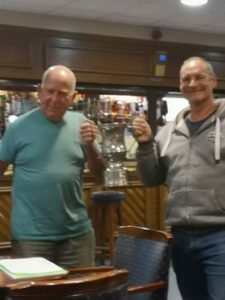 I wish we had more photos to show but as mentioned earlier, we have been struggling. 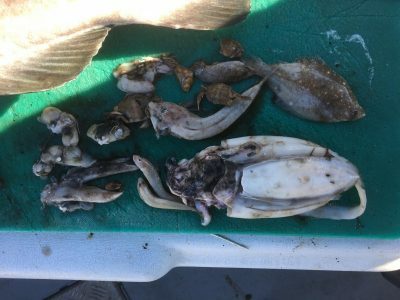 One of the earlier cod, a modest fish 6lb 11oz caught by Steve Kelley underwent a quick autopsy and demonstrates what a wide range of food they actually eat – nature’s dustbin. 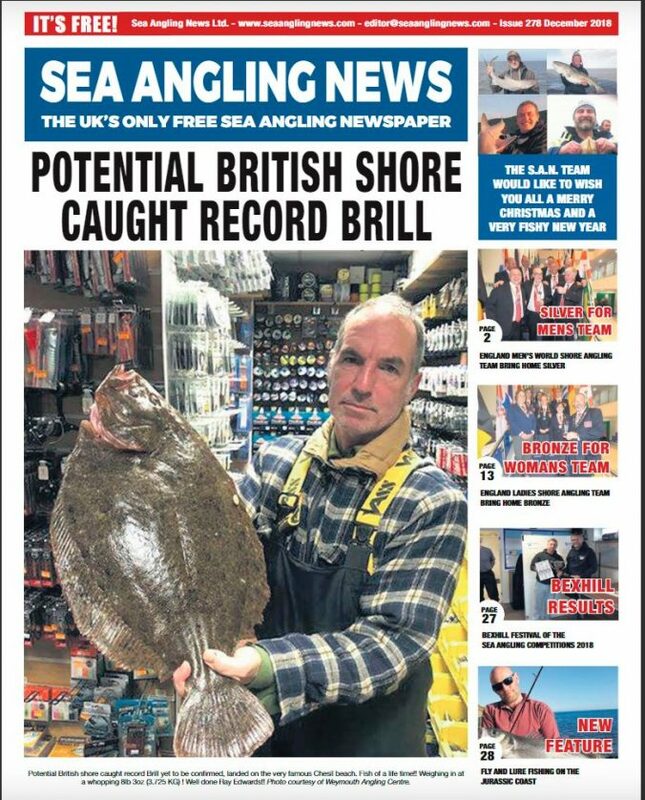 From that you might think there is no excuse for having the “wrong bait”. 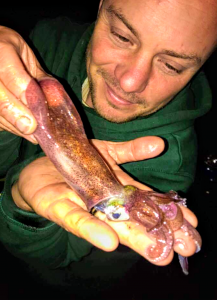 You can see squid, cuttlefish, dab, crab, dragonets, shellfish, probably a pout and other unidentifiable objects. 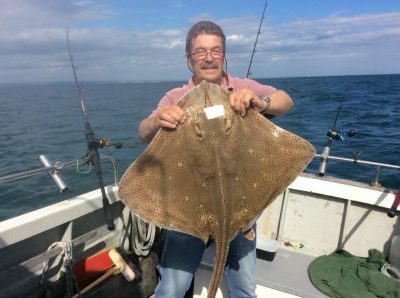 In the last week we were much encouraged by Tim Andrews and John Evans who turned the corner by catching not one cod but several. Things are looking up at last. 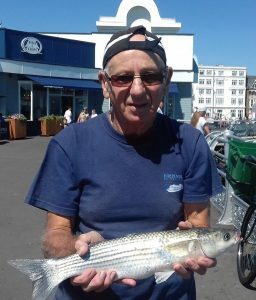 Specimen fish reported by Southsea Marina Angling Club this month were a bass of 11lb 10oz for Dave Ford; bass 10lb 8oz to Tim Andrews; undulate ray 14lb for Chris Ellis and Heber Crawford had several large mullet, best 5lb 12oz. 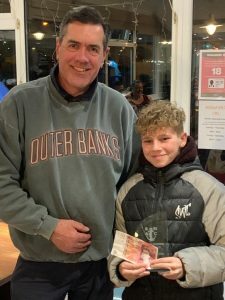 Last month we featured junior anglers but we also encourage and celebrate the success of new anglers who may not be as young. 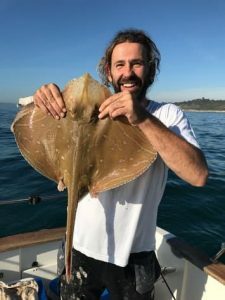 New member Mike Gibbons was taken out by Bill Arnold on Limpet for his first ever boat trip and was rewarded with these small eyed and blonde rays. 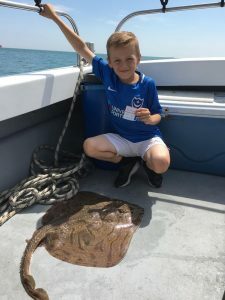 He also caught brill, tub gurnard, launce and mackerel. 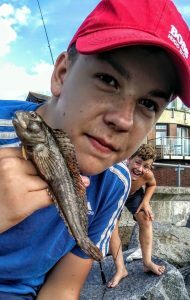 Now wonder he’s smiling. 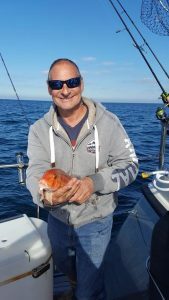 We are now well into September and watching the transition from summer season to autumn. 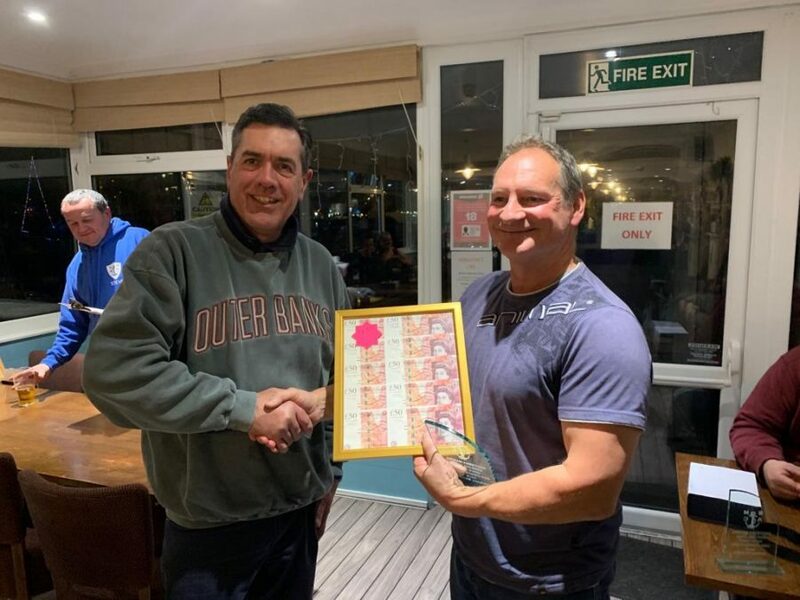 One of the milestones is the Southsea Marina Angling Club summer BBQ which was held on one of the last sunny weekends before the wind and clouds started to make more of an appearance. 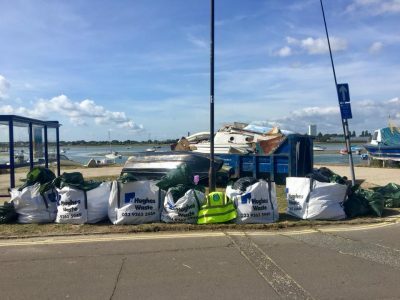 We had great intentions of doing a beach clean on the day, but our efforts were overshadowed by the amazing work that The Final Straw Solent have been making clearing rubbish from our local beaches and harbours – including entire boats! 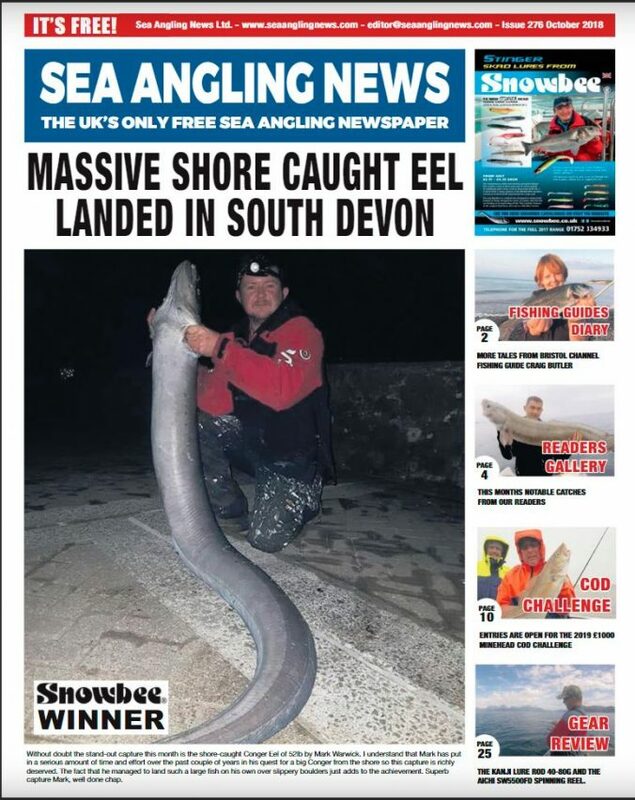 Watch out for the publicity for their next mass beach cleans. 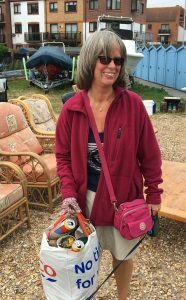 Back to the SMAC BBQ: Esme Andrews represented the club in the beach clean so at least we did something on the day! 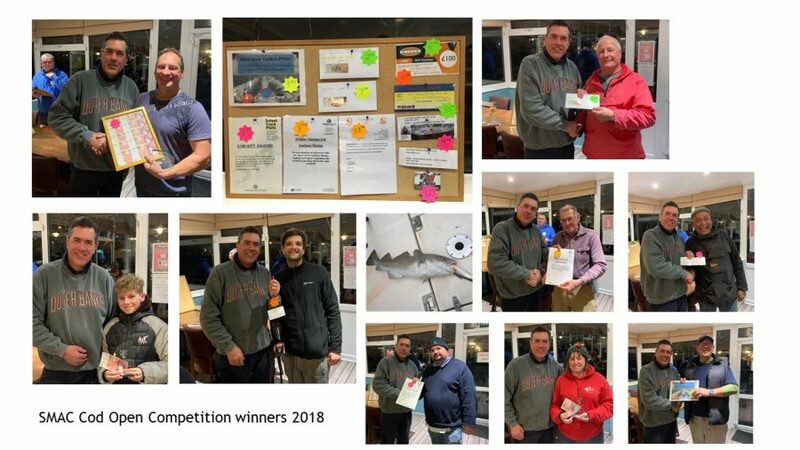 An impromptu raffle also raised over £70 for the RNLI, which has since increased significantly from donated prizes from the monthly awards. 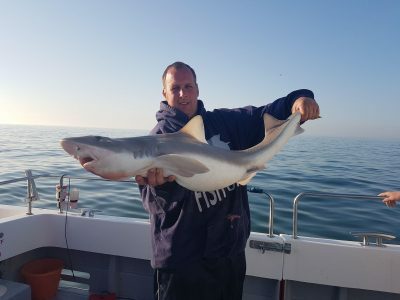 Shark fishing has attracted more attention this year because threshers are regularly sighted south of the Island. 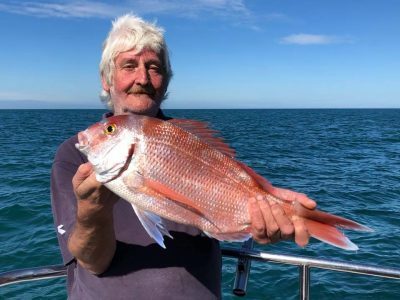 Several charter skippers have been running exploratory trips and with the experienced gained we hope to hear of some interesting catches in due course. 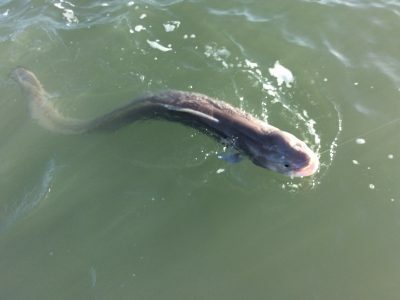 The first codling have been reported, they usually appear in nets and pots before anglers catch them. 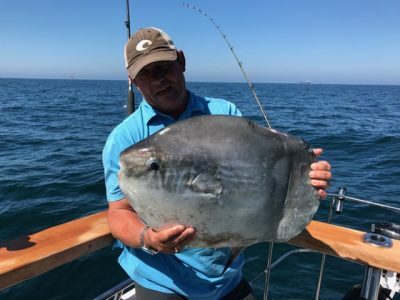 This is surprising because with the water temperatures so high we were expecting a later arrival, but they seem to be sticking to the calendar. 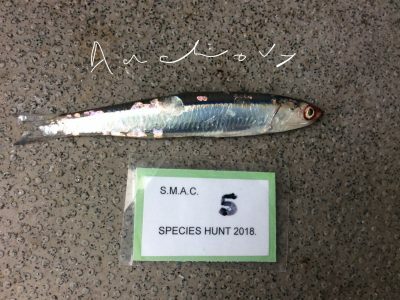 There are still mackerel and scad around but not in such large numbers as last month. 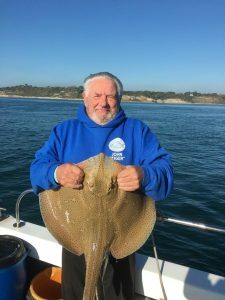 The plaice are feeding well and will still be around for a couple more months before moving offshore, returning in March. 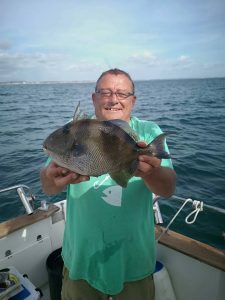 Another seasonal visitor is the trigger fish, which arrive in September, stay around for a month then disappear. 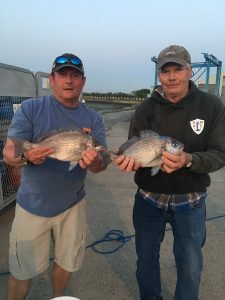 Bill Arnold and Luke Scott both caught some nice specimens. 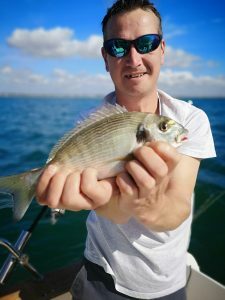 Inshore rocky marks, squid or fish strip baits, small hooks and very strong traces – even wire – are the winning mix. 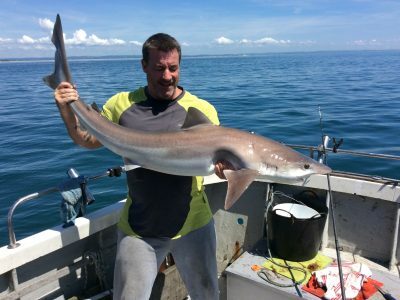 Triggers have very powerful toothy jaws and can easily cut through light mono. 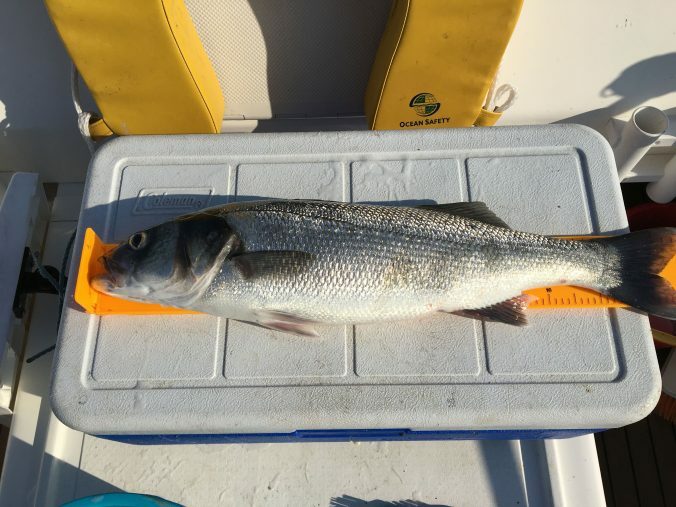 Some good bass have been caught throughout the year, and we welcome the promised relaxation of the bass rules which we expect will allow us to keep one fish per day over the size limit. 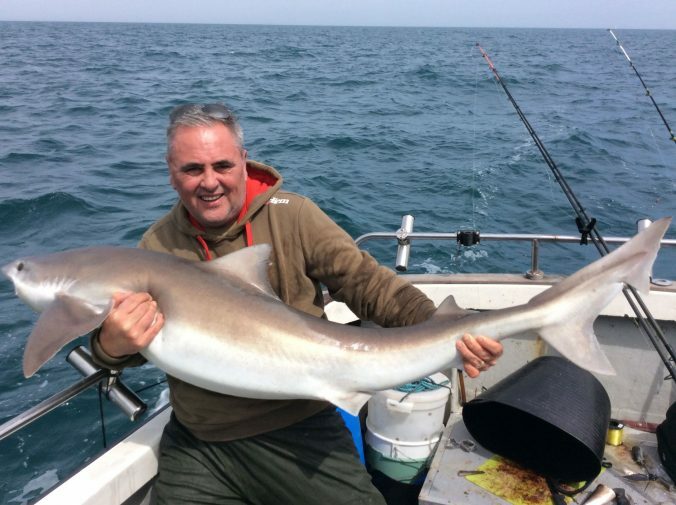 Dave Ford caught and released a magnificent 11lb 10oz fish. 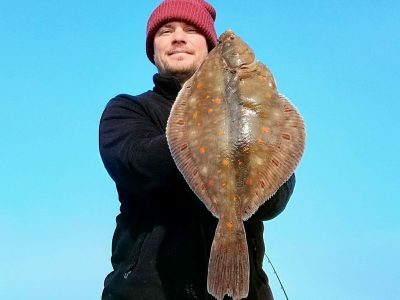 Turbot are always a popular target although we don’t get many in the area, or of the size you will find further south. 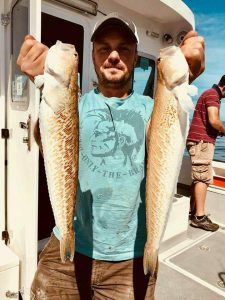 However, Chris Sartow, Tim Andrews and Kev Johnson were very happy to land a few this month. 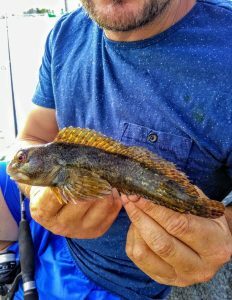 One of the many wonderful things about fishing in this area is the variety of species available. 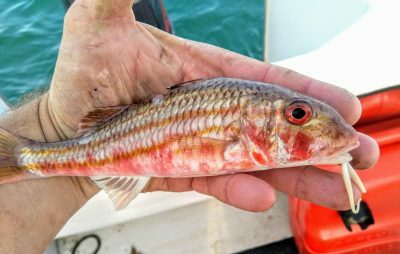 Heber Crawford shows off some impressive weevers and a red mullet. 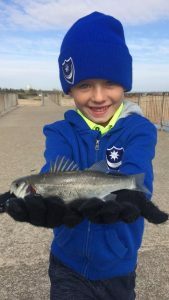 Luke Scott shows off his first gilthead bream. 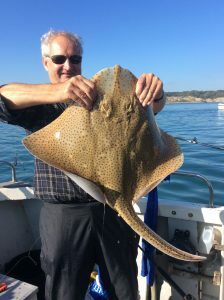 Peter Churchill demonstrates the quality of ray fishing with an large blonde and Chris Sartow shows the patterns of a nicely marked undulate. 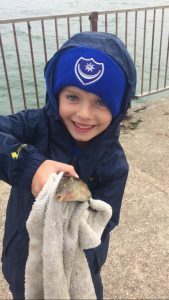 We always enjoy seeing the delight on our junior anglers’ faces when they show off their catch – as demonstrated by Archie Crawford with his bass and Ivy Brudenell with her first mackerel (hopefully first of very many). 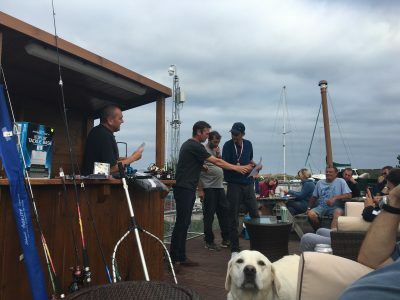 There is nearly always something not quite right when you go boat fishing. 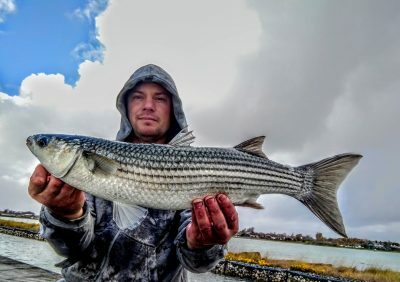 Tides are too small or too big, wrong bait, cloudy water, weed…but this month we couldn’t complain about the weather. 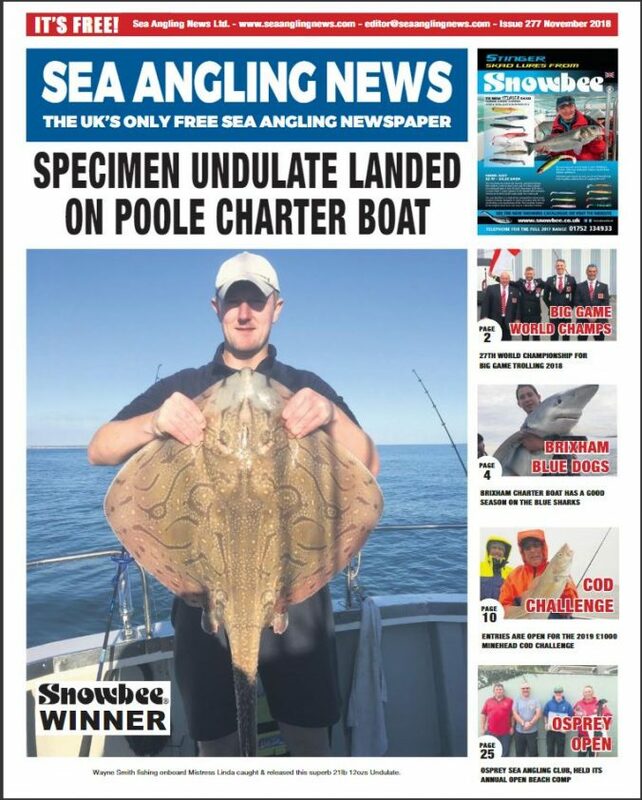 I can’t remember so many fishable days crammed into the month. 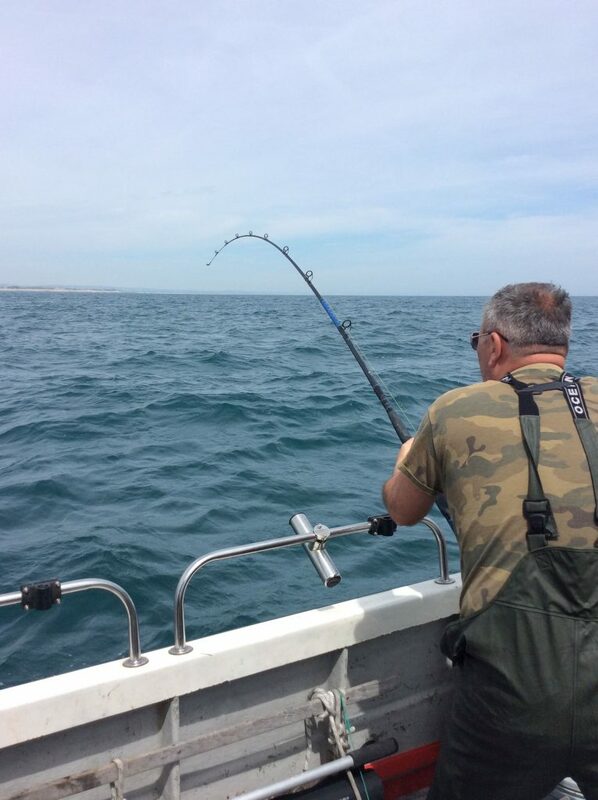 Sitting comfortably on a blue sea, topping up the tan and banter with mates makes poor fishing bearable. And there have been some quiet days recently, where we have been scratching for a few mackerel, pout and dogfish. 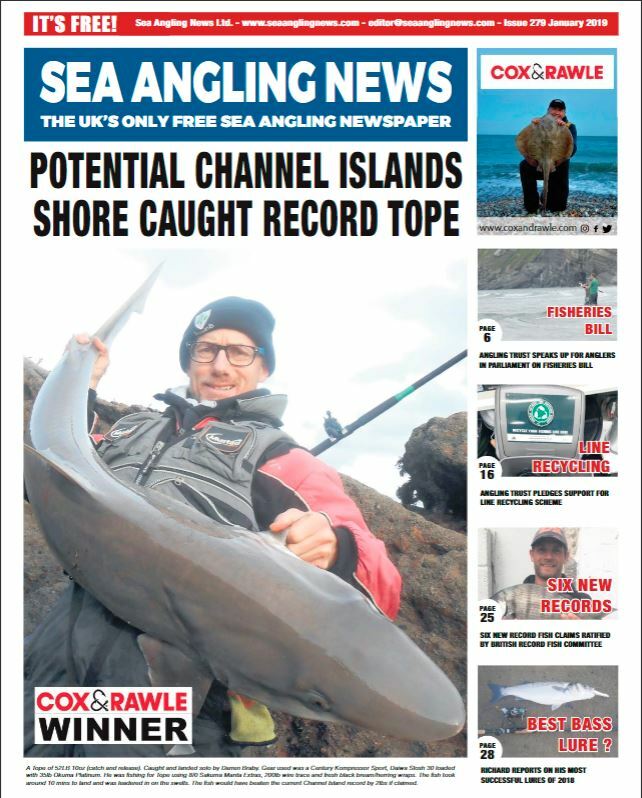 Other days have been very good including some spectacular tope fishing. 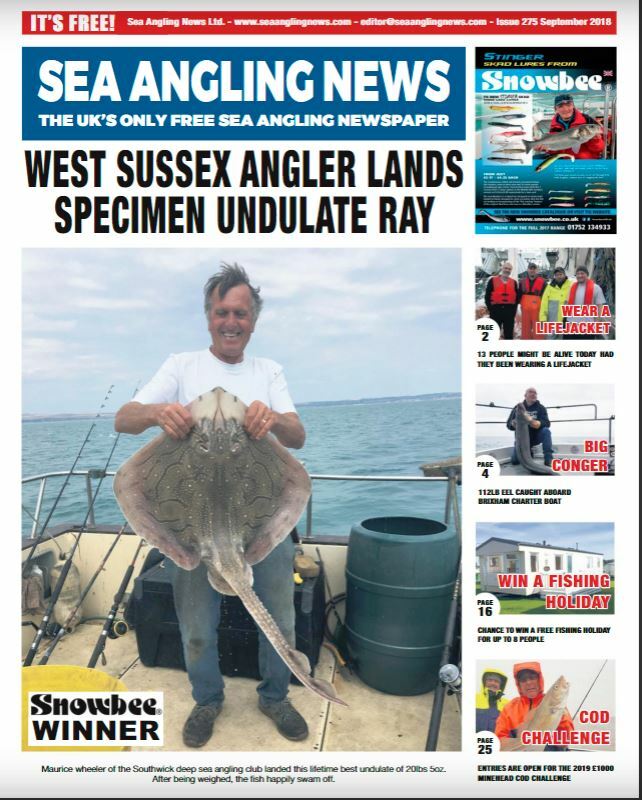 Top fish in this report is Ian Draper’s 64lb tope which he matched up with another good specimen of 50lb. 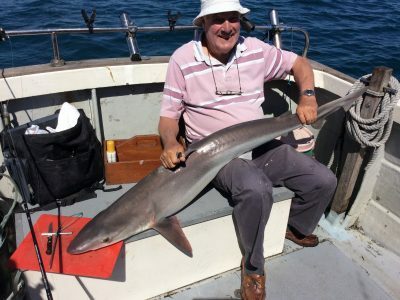 To prove that experience can beat youthful energy, John Churchill at 80 years old tamed this tope (pictured) which was in excess of 50lb. 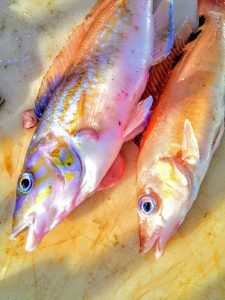 To reduce stress on fish to be returned, weight is often estimated which is why we don’t have exact weights in all the photos. 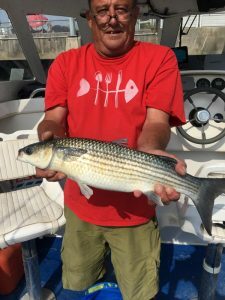 Fewer boats are targeting bass as there is a landing ban for 2018, but there are still good stocks in the area and regularly turn up on general bottom-fishing trips. 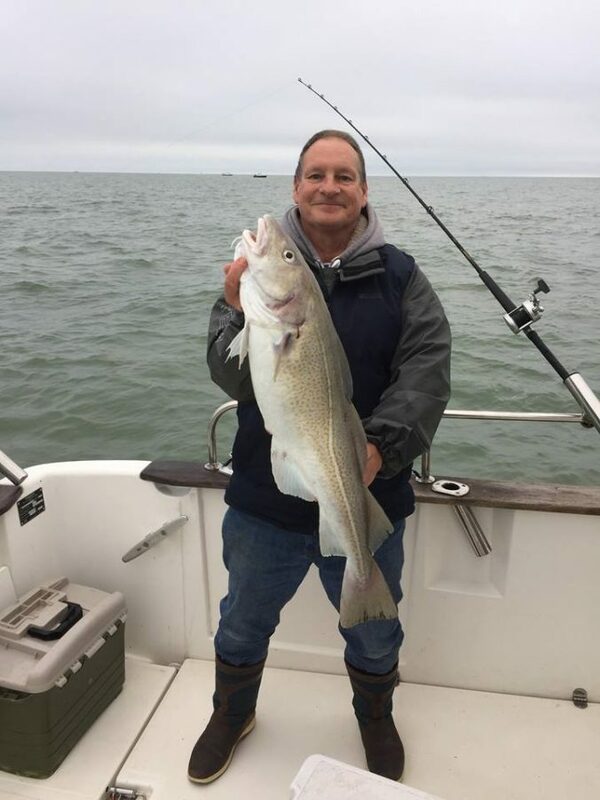 Our local butcher Mo Twells shows off the typical stamp of fish with a healthy 5 pounder. I am pretty sure that is the same hat he wears behind the counter too. 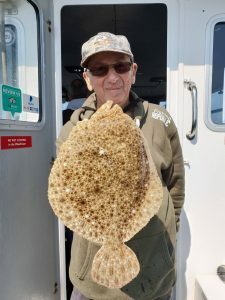 We usually have to motor much further afield for turbot of any size: Heber Crawford is showing off a very pretty fish caught from one of the Langstone boats over the offshore banks. 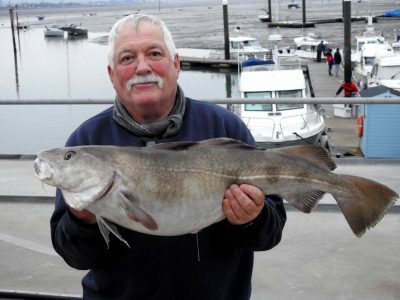 However, Kriss Scott caught a magnificent inshore fish (for the area) of 8lb. 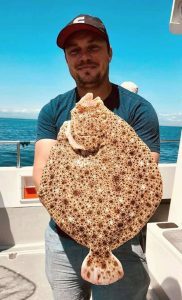 This was awarded SMAC “Fish of the Month” because you just don’t see turbot of that size here, even though the Specimen Book thinks otherwise. 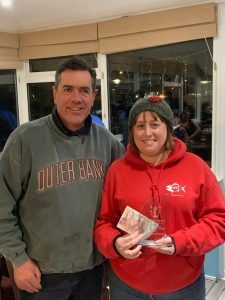 This fish pipped Luke Scott’s huge (relatively) three-bearded rockling of 1lb 8oz which was an official Specimen and impressive in the rockling circles but not impressive enough to win the votes for Fish of the Month from our discerning members. 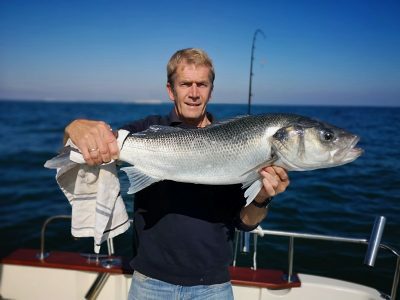 Even nearer to shore, Peter Churchill tempted this mullet of 3lb 12oz. 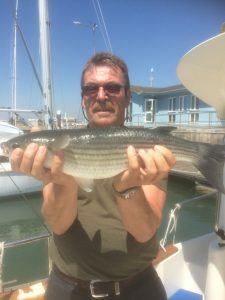 We regularly see some very large mullet in the marinas but they can be very picky so this was a good catch. 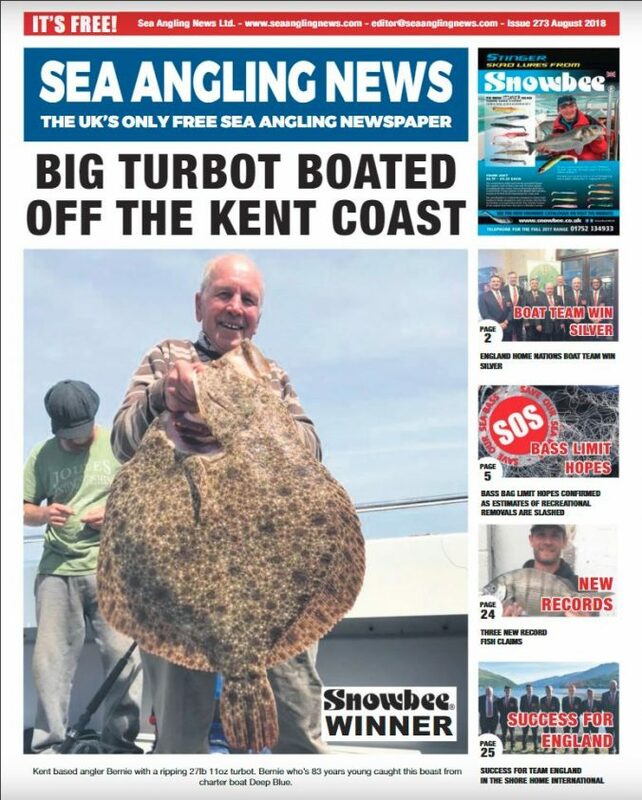 Some of my wealthier angling friends pay a lot of money to fish famous river and estuary beats for sea trout. Heber Crawford proved this is not always necessary. 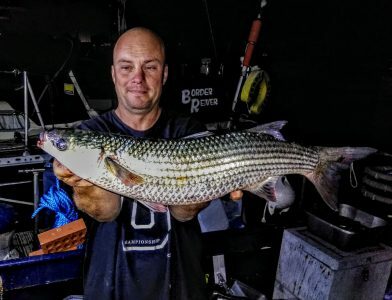 While fishing for mullet with a LRF rod and a tiny fly spoon, he noticed a dark shadow and a swirl behind the lure. 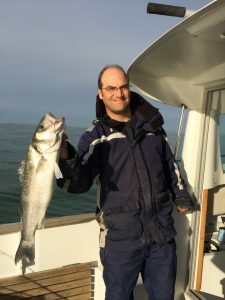 Casting again he was rewarded with this stunning sea trout. After the photo-call it was promptly returned. 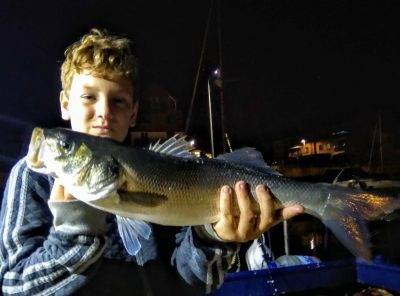 Young Archie Crawford returned with Dad a day or two later and first cast hooked another sea trout! 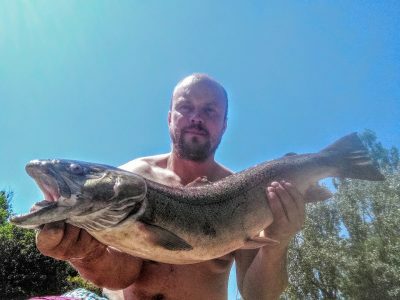 Before anyone thinks this is a regular thing in the area, these are the only two sea trout reported from this tidal creek that I can recall. 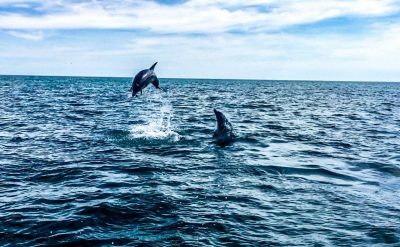 The many calm days have allowed us to observe more under-water traffic than usual. 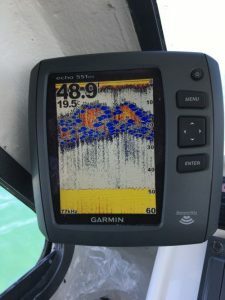 We have seen large numbers of jellyfish, and also some large and very dense shoals of fry – see the photo of the fish-finder screen. 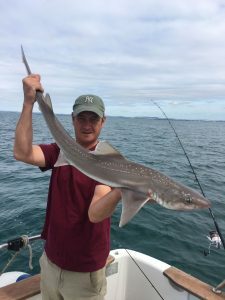 This indicates a smaller number of predatory fish around, and it also makes it more difficult for anglers to tempt mackerel with feathers when they have such an abundance of the real thing to eat. 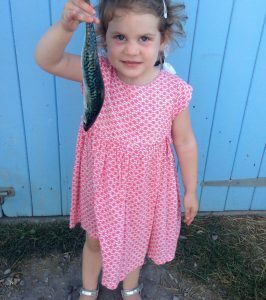 This might also explain why the mackerel we have caught are invariably stuffed so full they are like little round torpedoes.